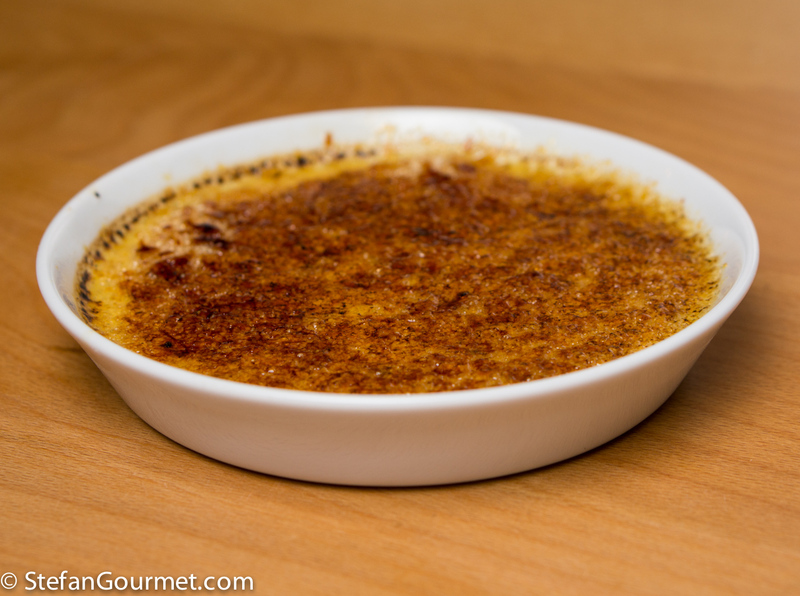 Crème Brûlée is one of the best known and most delicious of French desserts. I used to make it often about a decade ago, long before I started blogging. Back then I made it so often that I got tired of it. But now I was reminded by a friend who asked for the recipe. And so I made it again, and it was wonderful. 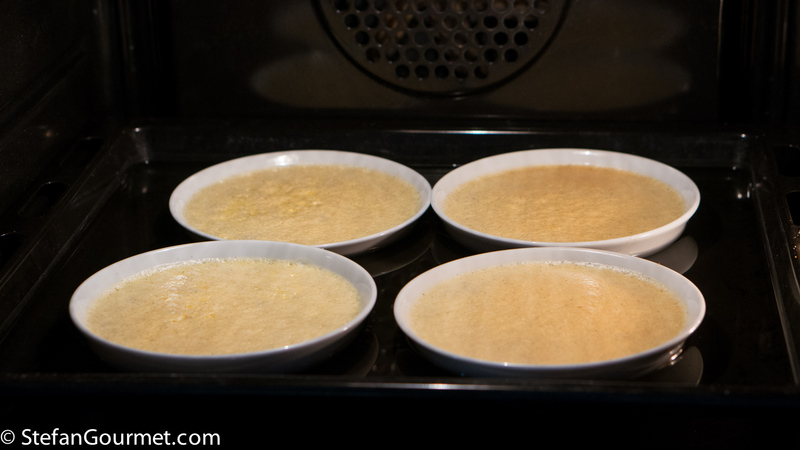 The crispy layer of caramelized sugar on top should be warm, but the custard underneath should be cool. This doesn’t only give a nice contrast in temperatures, but the custard also tastes much better when it’s cool. 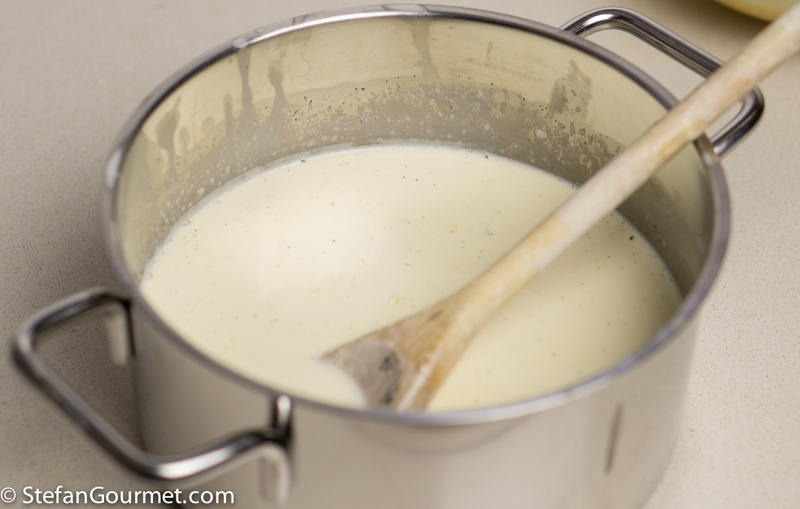 This means that it is best to use a burner to caramelize the sugar, as that won’t heat up the custard underneath as much as using the broiler would. In any case you should start with cold (refrigerated) custard. 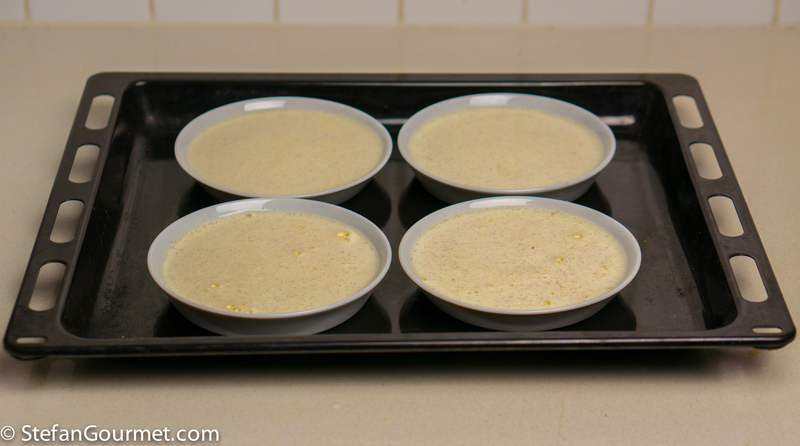 If you have to use a broiler, make sure the ramekins are ‘au bain marie’ in ice water, to keep the custard cool. 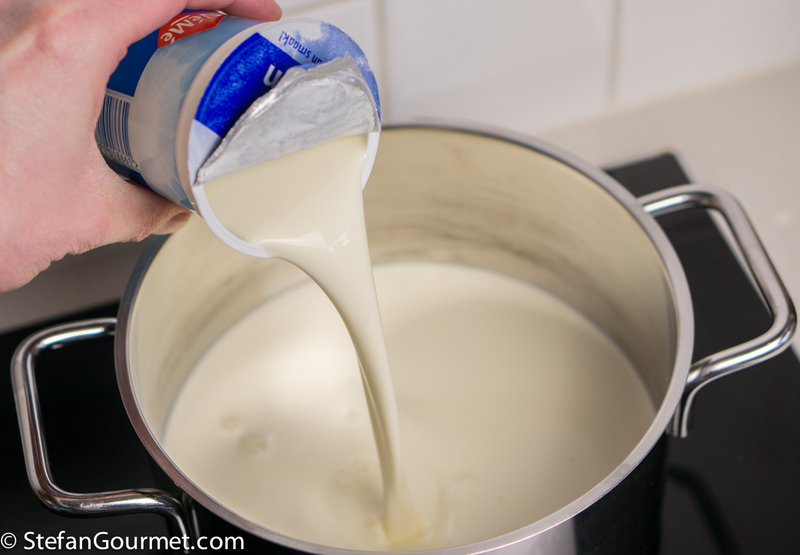 You can prepare the custard beforehand (and you should, because it should have time to cool off in the refrigerator), but caramelizing the sugar should be done at the last minute. The ratio of crispy caramelized sugar to voluptuous vanilla custard should be such that you can combine both in each bite that you take. Otherwise you don’t get to taste the beautiful contrast that is the essence of Crème Brûlée in the first place in each bite. This means that you should use a wide shallow ramekin rather than a tall narrow one, with a diameter of approximately 12.5 cm (5 inches). 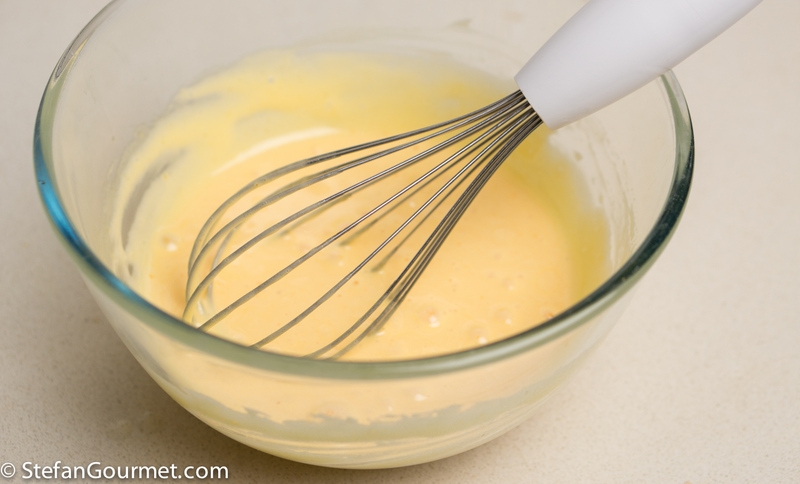 It goes without saying that to get a creamy custard, you should use cream for it (at least 30% fat content) and no milk. This adds some calories, but who is counting calories when you are having Crème Brûlée?! 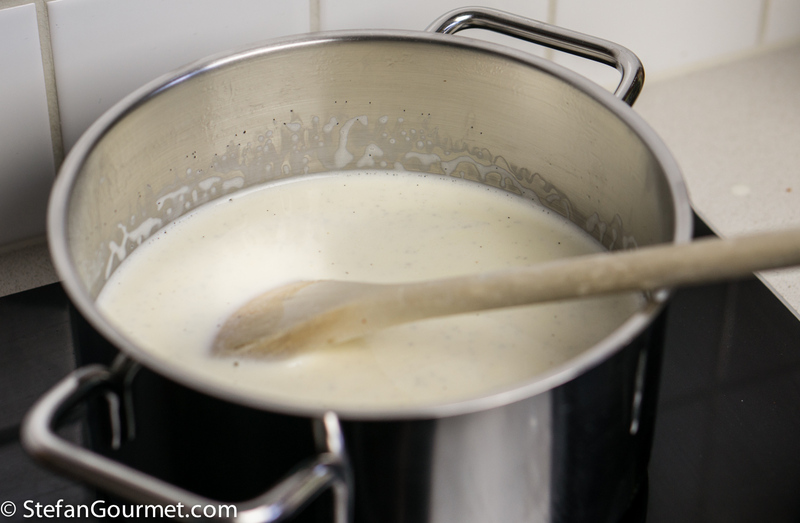 Pour 500 ml (2 cups) heavy cream into a saucepan. 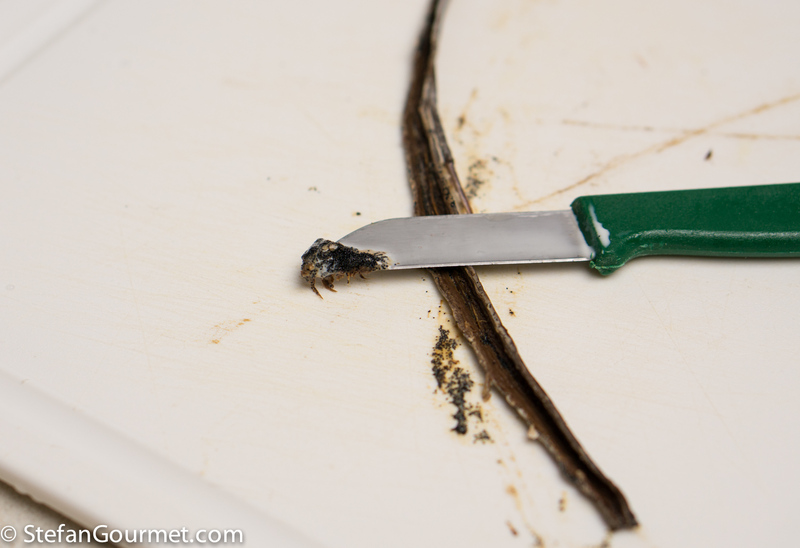 Cut a vanilla bean in half lengthwise. 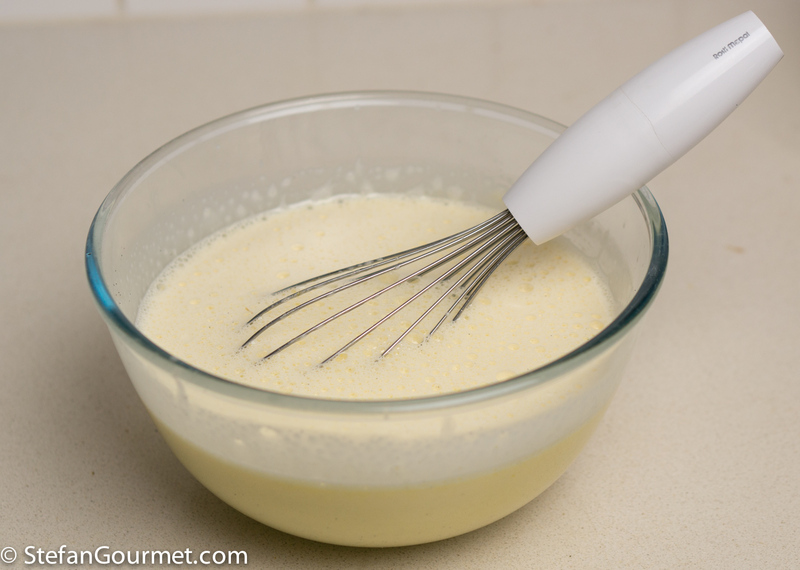 Put the vanilla bean into the cream. Heat the cream over medium high heat, stirring, until it almost boils. But make sure it won’t actually boil. 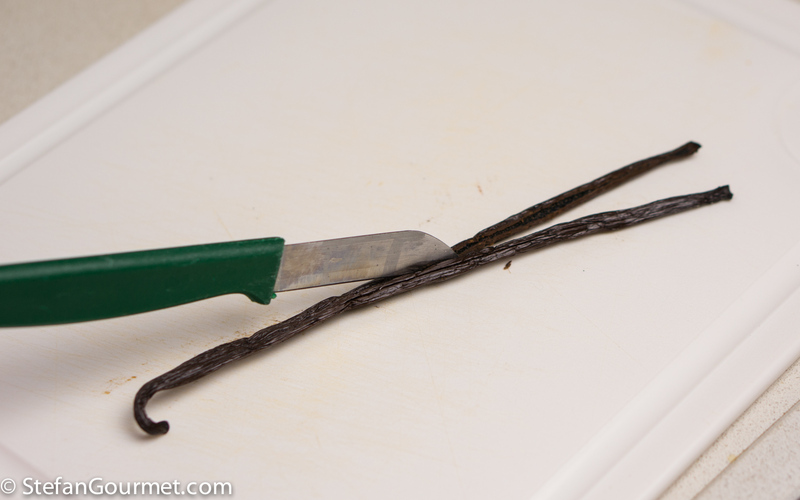 Turn off the heat at once, and allow the vanilla to steep for 10 minutes. 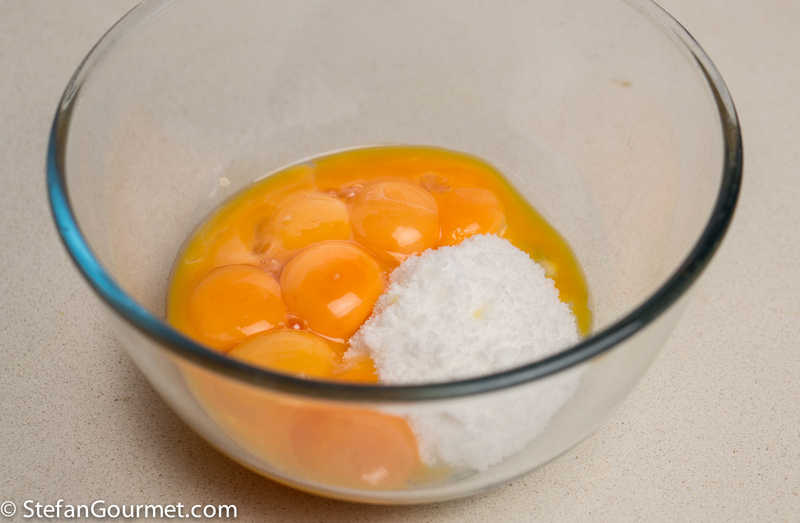 Meanwhile, combine 6 egg yolks with 75 grams (6 Tbsp) of sugar in a bowl. 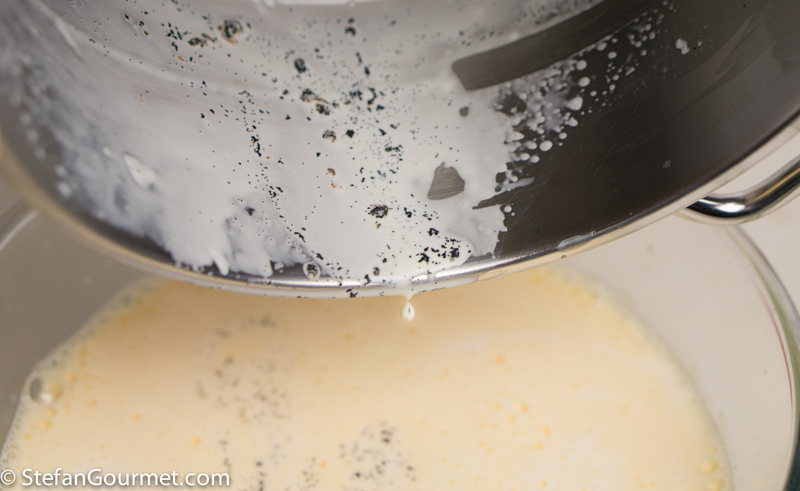 …until the mixture is pale and creamy. Do you notice the change in color? This takes about 1-2 minutes. 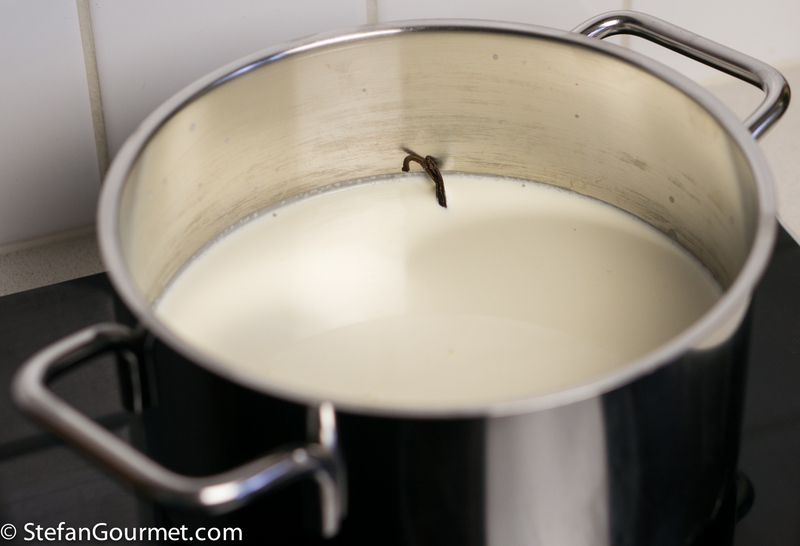 …and return the seeds to the cream. Discard the bean. 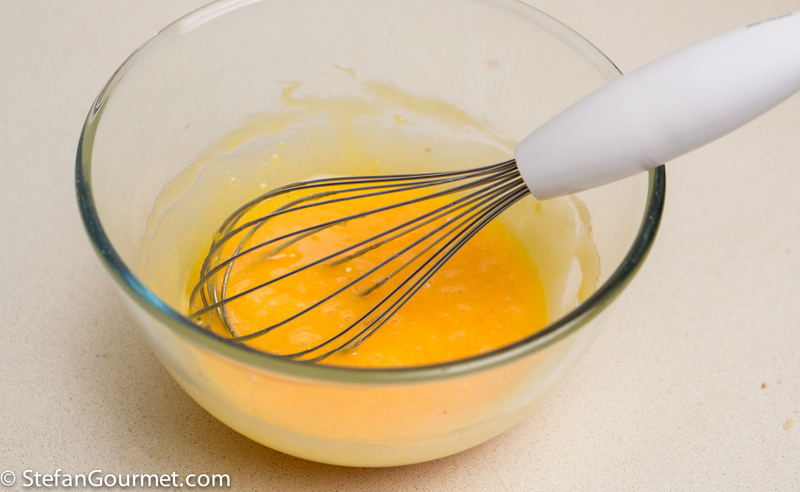 Add the vanilla-infused cream to the egg yolk and sugar mixture. Make sure you include all of the vanilla seeds as well. Put 4 ramekins in an oven proof dish that is big enough to hold them, or in a deep cookie sheet. 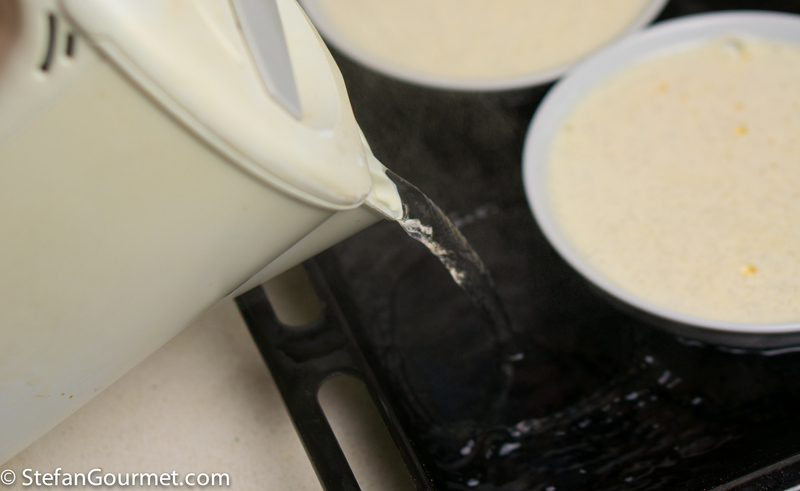 Pour the custard into the ramekins. Pour boiling water next to the ramekins until they are submerged about halfway. 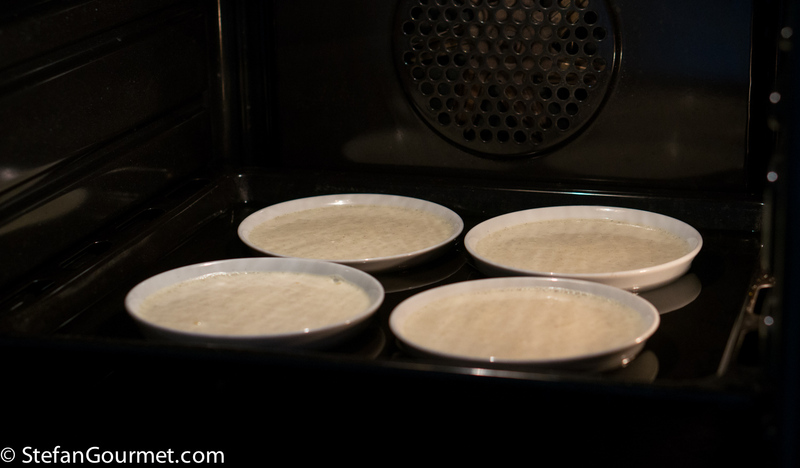 Bake at 150C/300F until the custard has set, about 40 minutes. Lift the ramekins out of the hot water to allow them to cool. Allow the custard to cool to room temperature. 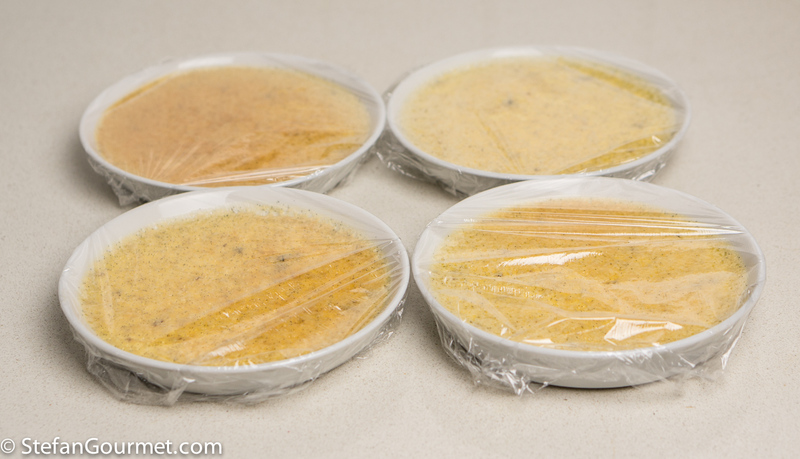 Once the custard has cooled to room temperature, cover with plastic wrap and refrigerate to chill. 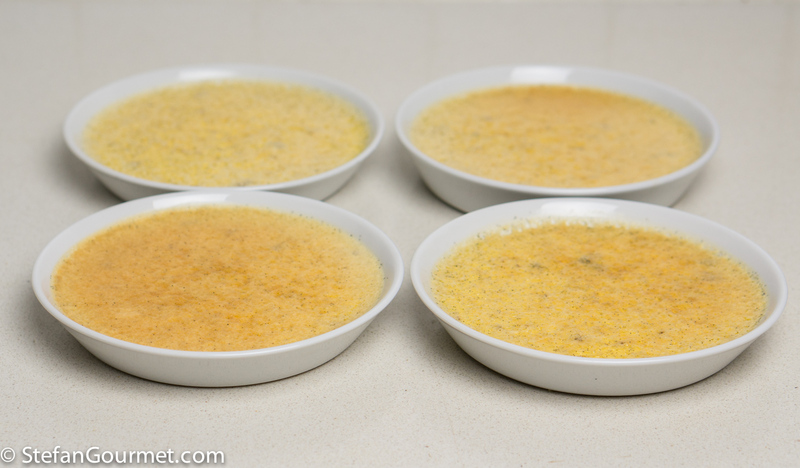 Once it is time to serve, sprinkle the top of the custard in each ramekin with a tablespoon of cane sugar (after removing the plastic wrap, obviously…). Use a burner to caramelize the sugar. The sugar should be brown but not black (i.e. burnt). It helps to keep moving instead of holding still at the same spot. Allow a minute or so for the caramelized sugar to cool slightly and become crispy (which you can check by tapping on top with a spoon). Serve at once. This is nice with a sweet muscat with some caramel notes, like a fortified aged muscat from Australia. Risotto with pear, gorgonzola, and walnuts is a classic yet unusual and delicious combination. Really good info! I know some people advocate for cooking the filling sous vide – any thoughts on that? In this case I don’t think it will taste any better and I don’t think it will be easier, so I don’t know what would be the point? For a larger pudding/custard, it is easier and I do use sous-vide to cook it (so it will cook more evenly than in the oven). 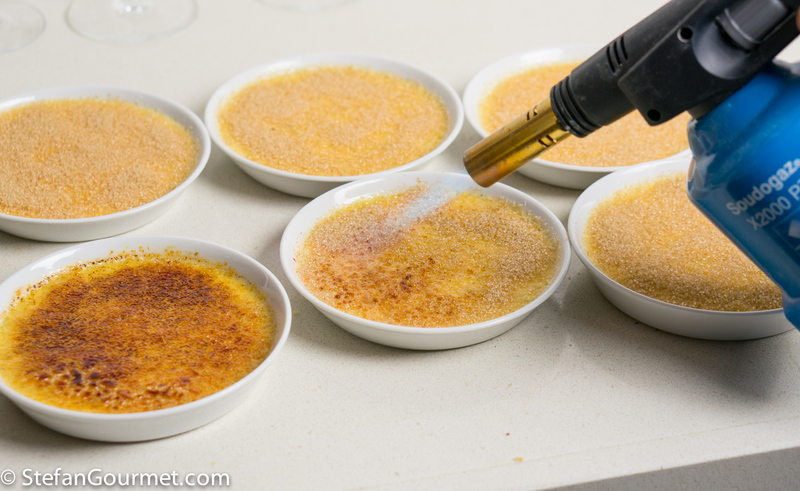 I love to try different flavors: passion fruit creme brulee is one of my favorites. 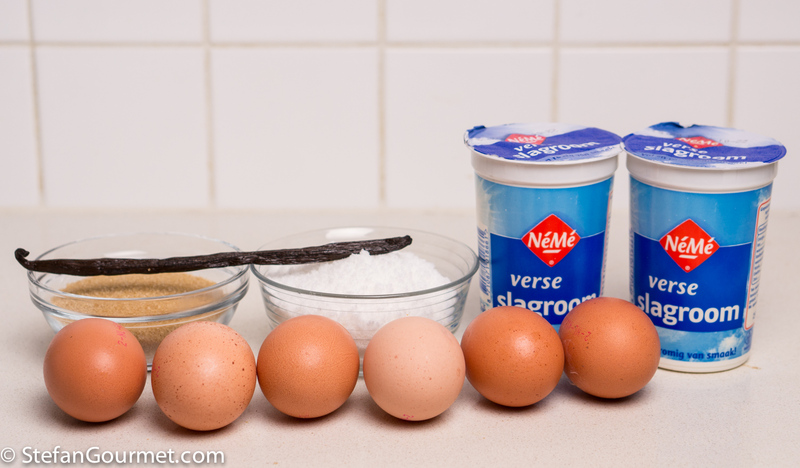 As well as white chocolate, an ingredient I hardly ever use, but that works so well with cream and burnt sugar. Although, right now that I am not really having sugar, I can only dream! Passion fruit creme brûlée is my favorite. Must be tough having no sugar. Hopefully soon you can indulge again. I’ve never had either passion fruit creme brulee or white chocolate (an ingredient which I hardly ever use either), so I guess that will have to change. Thanks for the inspiration! That looks amazing! I like the ice bath tip, too if you don’t have a torch. What do you do with the leftover egg whites? You could always make some meringues. Oh wow, all kinds of goodies to make with them! Angelfood cake! Everyone will love you, nuff said. No one is counting or should counting! 😉 Very skillful information/tips. I too use a burner but I have been wondering about the advantages/disadvantages of using the broiler. I guess you answered my questions. Thank you so much! If you have a burner, I can’t think of any disadvantage of using that compared to the broiler. I didn’t mention in the post that most broilers will not heat evenly, so there are ‘hot spots’ and ‘cold spots’, meaning that part of the sugar will burn while other parts are still not even melted. I fully agree about the heavy cream! Either or! Which [ 🙂 ! ] explains why you still make it and I may not too oft eat it but love it to bits!!!!! Yes, and love the warm and cold also . . . In my book it’s better to have half of a creme brulee with full-fat cream than a full creme brulee with half-fat cream! What a perfect dessert. I adore crème brûlée! I even bought special ramekins and a blow torch to make them… and never did. That must change in 2016! Thanks for the recipe and inspiration. That should definitely change indeed! Beautiful ! Need to try my hand at this classy desert asap. Thanks so much! Passion fruit creme brûlée is my all time favorite. What is better than a rich, creamy dessert with a crunchy sweet topping. Hummm, now I am getting hungry. Making creme brulee sous vide in jars is another excellant method. All things custardy such as flan benefit from the very even temperature. When one consideres sous vide to be a bain marie another world opens up. There is a lot of cooking sous vide in jars information on line (where I got it) with two cautions: the jars should be at least room temperature and the lids should only be finger tightened, both to avoid breakage. Sous vide is the best way I’ve found to make coddled eggs too! Don’t see my comment anywhere, I’m still figuring out WordPress! Ok I just wanted to tell you that the Creme Brûlée looks great. And even though it’s a classic dessert, it’s seeming simplicity has always scared me, hehe. But now your post inspires me to try it. Thank you! Awesome! And excellent rules! Precisely! How could you tire of Creme Brulee? They look delicious. 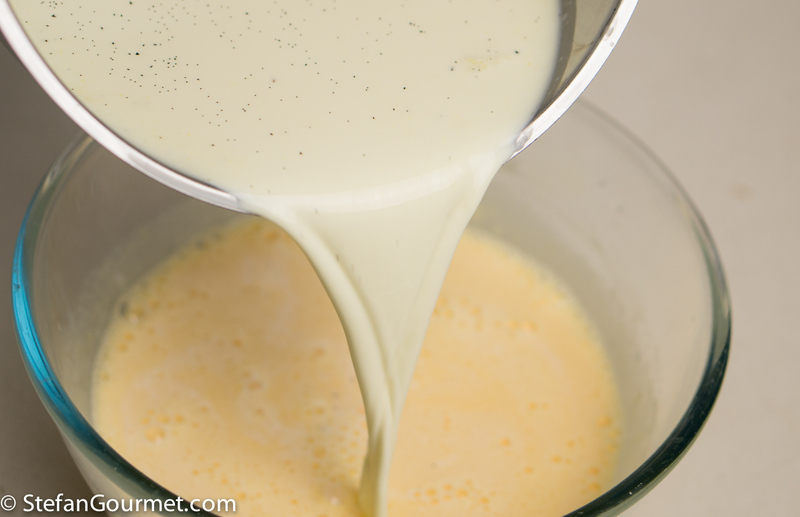 Have you tried to cook the custard in the sous-vide yet? 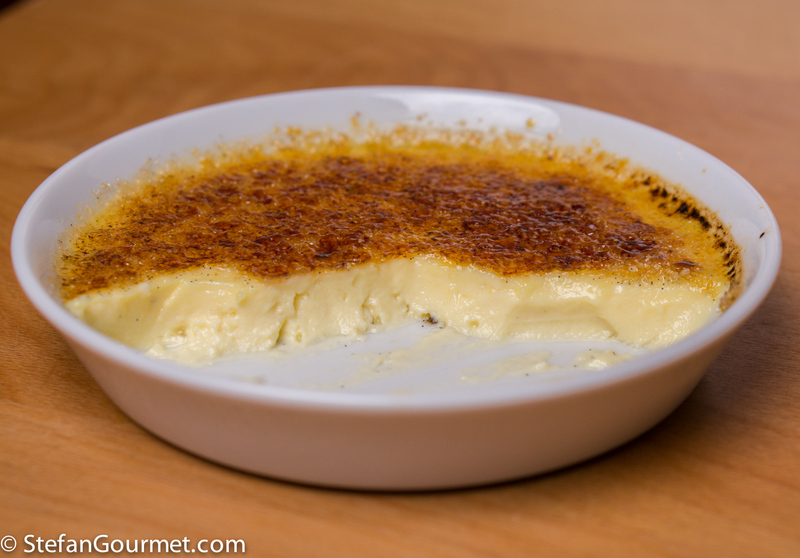 I have cooked another custard-like dessert sous-vide before, and that worked very well (https://stefangourmet.com/2011/12/21/bounet-sous-vide/). For these shallow ramekins, which are ideal for the correct ratio of custard to caramelized sugar, baking them in the sous-vide would be a bit tricky. And I could probably only fit in two ramekins at a time. Cooking the custard sous-vide in a bag and then putting it in the ramekins seems like too much trouble. Also because I don’t expect the sous-vide custard to taste any different. Because of that, I’d only cook it sous-vide if it were easier. Which I think it’s not. Looks delicious. Can’t wait to make it. I also want to make it sous vide. There is a video at chefsteps.com . If you do use that technique, please post it on your blog.